You just never know who you are going to meet on board! On a recent flight to Johannesburg, South Africa I met a customer who I’m going to refer to as Mae. Mae was travelling a great distance alone (from Dublin to Dubai to Johannesburg) and was returning home from a visit with her family. It was her first time flying with us, so my colleagues and I did our best to make the trip special for her! It turns out that Mae is an elementary school teacher, who teaches grades 3/4. 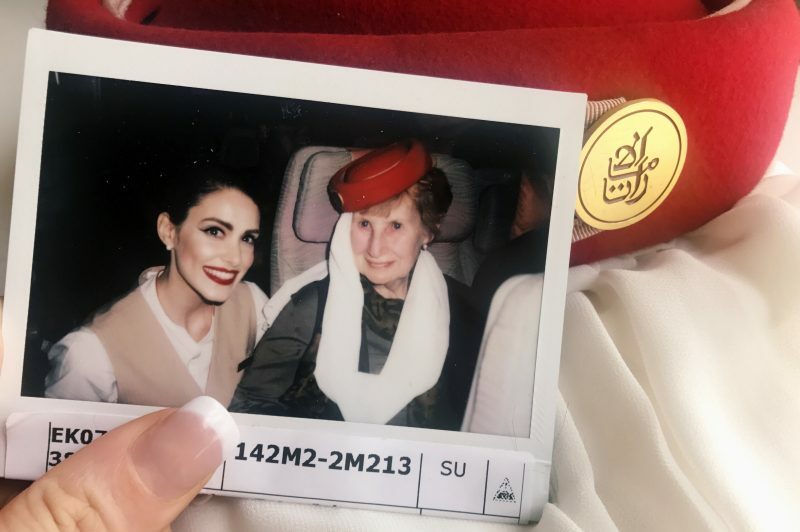 She told us that she is looking forward to sharing her travel stories with her students and that she couldn’t wait to show them her Emirates souvenir- a photo that we took of her on board. I told her that I couldn’t wait to show you guys mine too! Do you have any cool passenger stories from on board? If so, please share them with me in the comments below! Btw, I would LOVE if you make a video of your Emirates makeup routine! You're so gorgeous! That’s so cool! Thanks for sharing that with me. I hope you have a pleasant trip to Seychelles! It’s a beautiful place- one of the first layovers I ever had if I recall correctly. There are a lot of beautiful places there to snap photos!